Some people may say that they don't feel "lop-sided" or have any pain, and conclude that they have no subluxations. 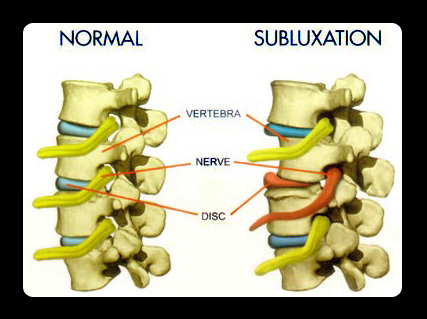 As shown in the diagram below, a subluxation restricts nerve flow, but not all the nerves flowing out of the spine are ones that cause pain. This means that you may be unaware of an interrupted flow which could be affecting the way your entire body works. When a nerve is impinged, the body will adapt to that change, but the "survival mode" it goes into cannot last for long, and will cause alterations in other body systems. Clearing this up through spinal manipulations is like removing debris from a river so that it can flow smoothly and naturally. 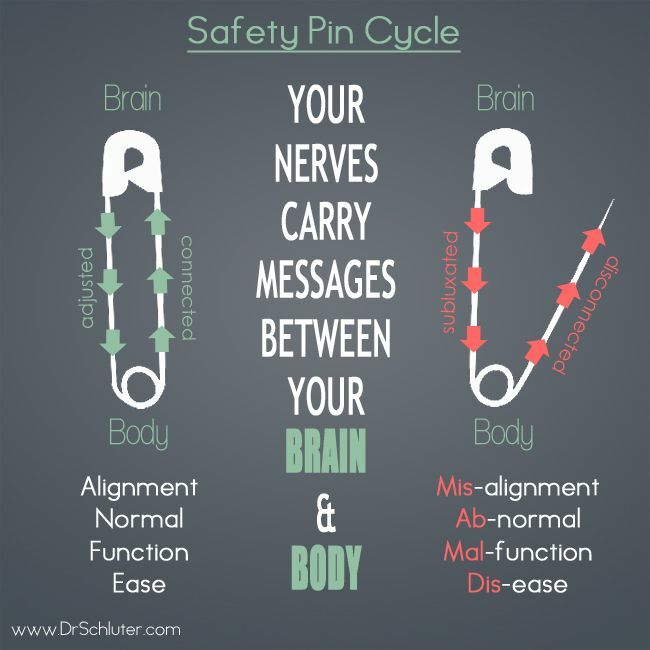 The “Safety Pin Cycle” is one way to explain the philosophy behind subluxations and chiropractic manipulations. This simply shows that the nerve connection needs to be complete and connected in order for the body to function properly. Spinal manipulations work to free up that nerve flow and restore order. Adjustments aren’t all about back pain. The infograph below explains some of the many connections between each section of the spine and different body systems. 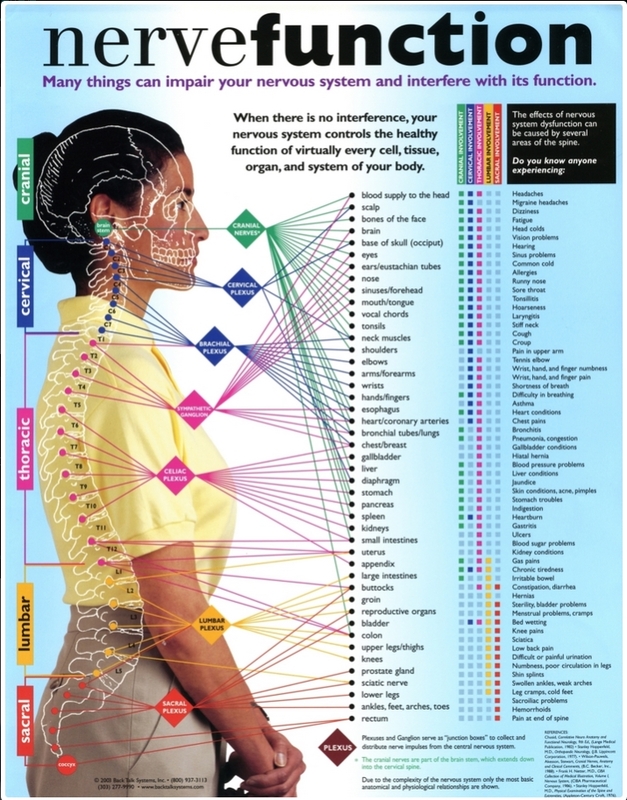 The connection between spinal alignment and overall health is not hard to believe, seeing that many different systems are affected by each nerve that comes out from the spine. The detailed web of associations only scratches the surface of the amazing interdependence and intricate homeostasis in the human body. Here’s a powerful study conducted by an MD regarding the connections we just talked about. "Chiropractors claim that by adjusting one vertebra, they can relieve stomach troubles and ulcers; by adjusting another, menstrual cramps; and by adjusting others conditions such as kidney diseases, constipation, heart disease, thyroid conditions, and lung disease may resolve–but how?" Dr. Winsor decided to investigate this new science and art of healing, chiropractic. "The object of these necropsies (dissections) was to determine whether any connection existed between minor curvatures of the spine, on the one hand, and diseased organs on the other; or whether the two were entirely independent of each other." "Two hundred twenty-one structures other than the spine were found diseased. Of these, 212 were observed to belong to the same sympathetic (nerve) segments as the vertebrae in curvature. Nine diseased organs belonged to different sympathetic segments from the vertebrae out of line." These figures cannot be expected to exactly coincide ... for an organ may receive sympathetic filaments from several spinal segments and several organs may be supplied with sympathetic (nerve) filaments from the same spinal segments. In other words, there was nearly a 100 percent correlation between minor curvatures of the spine and diseases of the internal organs. All nine cases of spinal misalignment in the mid-thoracic area (T5-T9) had stomach disease. All 26 cases of lung disease had spinal misalignments in the upper thoracic spine. All five cases with gallstone disease had spinal misalignments in the mid thoracic. All three cases with pancreas disease had spinal misalignments in the mid thoracics. All 11 cases with spleen diseases had spinal misalignments in the mid thoracics. All 17 cases with kidney disease were out of alignment in the lower thoracics. The two cases with the uterine conditions had the second lumbar misaligned. All 20 cases with heart and pericardium conditions had the upper five thoracic vertebrae (T1-T5) misaligned. Dr. Winsor’s results are published in The Medical Times, November 1921, and are found in any medical library. That’s right, folks: 1921 !!!!! Much of this article was modified from an original article from Tedd Koren, D.C. Since Dr. Winsor’s study, there have been countless others which confirm the efficacy of chiropractic care. Call our office today and ask one of our staff members if you can schedule a consultation with Dr. Moleski to find out how chiropractic could help you. We would also love to share with you one of our own incredible chiropractic success stories!